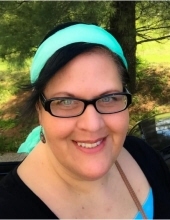 Bethany Lynet Fielding Anderson, age 45, of Lexington, Kentucky, formerly of Olive Hill, Kentucky, passed away Wednesday morning, April 10, 2019, at the University of Kentucky Medical Center in Lexington, Kentucky. She was born May 1, 1973, in Rowan County, Kentucky, a daughter of Sandra “Sonni” Fielding Webb of Olive Hill, Kentucky. She was preceded in death by her maternal grandfather, Lovell “Dexter” Fielding; one uncle, Butch Fielding; and her step father, Rick Webb. In addition to her mother, Bethany is survived by one brother, Shane Webb of Olive Hill, Kentucky; one sister, Rona Brown Scott (Alphonzo) of Lexington, Kentucky; her maternal grandmother, Mary Lou Lawson Fielding of Olive Hill, Kentucky; three nieces, Zoe Scott, Zya Scott and Zayden Scott, all of Lexington, Kentucky; and one nephew, Zion Scott of Lexington, Kentucky. She also leaves many other family members and friends who will sadly miss her. Funeral services will be held at 1 p.m. Sunday, April 14, 2019, at Globe Funeral Chapel in Olive Hill, Kentucky, with Christy Brown and Pastor David Rayburn officiating. Burial will follow in the Tick Ridge Cemetery in Olive Hill, Kentucky. Friends may visit from 6 p.m. to 9 p.m. Saturday, April 13, 2019, and after 9 a.m. on Sunday at Globe Funeral Chapel, 17277 West Highway US 60, Olive Hill, Kentucky 41164. "Email Address" would like to share the life celebration of Bethany Lynet Fielding Anderson. Click on the "link" to go to share a favorite memory or leave a condolence message for the family.